Ohm’s law is the fundamental law of Electrical Engineering. 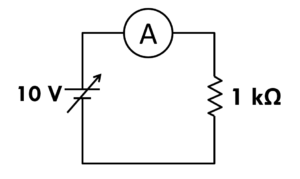 It relates the current flowing through any resistor to the voltage applied to its ends. According to the statement: The current flowing through a constant resistor is directly proportional to the voltage applied to its ends. 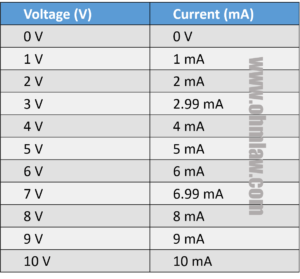 This article presents the complete Ohm’s law Lab report and various questions regarding the lab. The latter portion simplifies the law for beginners by delineating the absolute basic concepts for beginners. To verify that voltage and current are directly proportional using a 1kΩ resistor. Implement the circuit on the breadboard as shown in circuit diagram. Initially set the VDC supply to 0 V and note the current on ammeter. Increase the voltage to 1 V, observe the ammeter and note the readings. Repeat the above step for 2 V, 3V … 10 V.
Plot a graph for measured readings. Compare the plot with theoretical calculations. Make two columns (the third one for Sr. no is optional). The theoretical calculations are achieved from the original formula, V = IR. 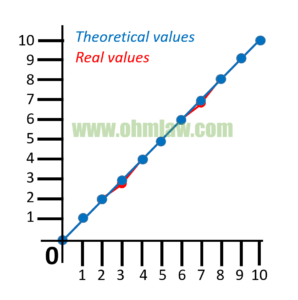 You can also verify them from the basic Ohm’s law calculator. The real (practically calculated – red color) vs the theoretical values (blue) are plotted on the graph. While most theoretical values are identical to practical values, one might note a difference of red dot for 2.99 mA and 6.99 mA. We learned that current and voltage hold a direct relationship for resistive components. (They are linearly proportional). 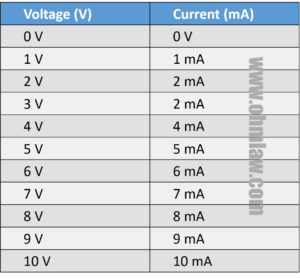 Question: What is Variable DC supply? Answer: A variable DC (direct current) supply provides variable output voltages. It contains a rotary knob which can be rotated to achieve our desired output voltages. Its symbol is similar to dc battery with the difference of an arrowhead over it. Answer: It is the current measuring instrument which is used in series to the circuit. It measures current and displays the amperes on LCD. Question: What is the resistor, and what is resistor color coding? Answer: Resistor is an electrical component which is used to control the flow of electrical current. Carbon resistors are the most commonly available type of resistors. They have color bands over their bodies which are used to identify the amount of resistance they possess. Question: What are jumper wires? Answer: They are special types of wires which can be easily mounted and used on the breadboards. Question: Is Ohm’s Law important to learn? Answer: Yes Ohm’s law is a fundamental law of Electrical Engineering and it’s very important. You can easily learn each and everything about the law from our website. Question: Why practical results are different from theoretical results? Answer: While no scientific-practical can perfectly match the theory, the actual results depend on environmental conditions, the accuracy of equipment under test. The quality of resistor also impacts the measurements, while in our lab report we got excellent results, you might get different results based on your theory.